The unsightly growths associated with xanthelasma that form around the area of the eyelids can cause embarrassment and frustration. At Synergy Medical Aesthetics, we understand the significant impact these growths can have on your self-confidence, and the indications they may present for your general health. If you suffer from xanthelasma, please contact our office in Nanaimo right away to meet with experienced dermatologist Dr. Gabriele Weichert. You can schedule your confidential consultation by completing the form on this page or calling 250-591-1566. We welcome patients from throughout Central Vancouver Island. Xanthelasmas are clusters of fat and cholesterol beneath the skin in the upper and lower eyelid regions. They start as tiny yellow bumps that gradually expand over time. Xanthelasma does not pose any direct risk to your health. However, when left untreated, they can become large enough to create significant aesthetic problems. In extreme cases, the condition can affect your vision due to the location of the growths. In many cases, xanthelasma sufferers are predisposed to the condition because of genetics. Women, middle-aged patients and certain ethnicities are among the higher risk groups for xanthelasma. The condition can also indicate a higher risk of heart failure or existing liver problems. While you may be mostly concerned about the cosmetic appearance of xanthelasma, it is important to meet with Dr. Weichert to discuss the medical implications of the condition. During your consultation with Dr. Weichert, she will evaluate your condition, answer your questions and explain your surgical and non-surgical treatment options. 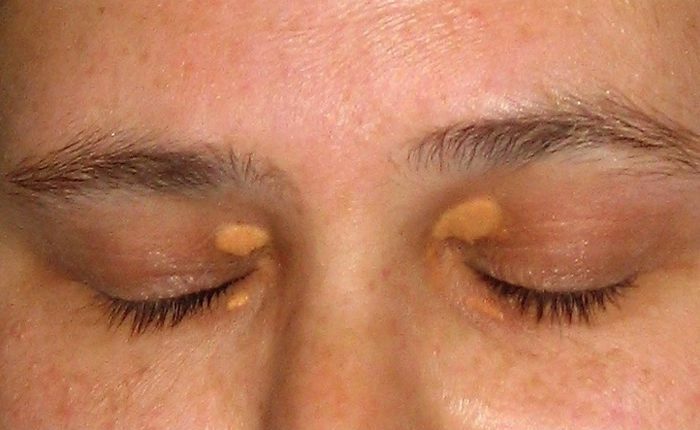 Xanthelasma presents unwanted growths and diminished self-confidence in social and professional situations, but the condition can also indicate deeper heath concerns. It’s important to visit with our experienced dermatologist as soon as possible to assess your condition and learn more about your xanthelasma. To schedule a consultation with Dr. Weichert, please call Synergy Medical Aesthetics today at 250-591-1566. We help patients from Nanaimo and neighboring Central Vancouver Island communities achieve vibrant, healthy-looking skin.